Aura nymph, Athenian red-figure vase C5th B.C. THE AURAI (Aurae) were nymphs of the breezes. They were daughters of either the earth-encircling river Okeanos (Oceanus) or the north-wind Boreas. 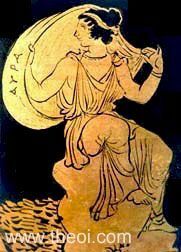 In the story of Kephalos (Cephalus) the dawn-goddess Eos was portrayed as a singular Aura. Similarly, the Titan-goddess Aura was a single personification of the breeze. "The world's end, the Elysian fields . . . [there] for men's refreshment Okeanos (Oceanus) sends out continually the high-singing breezes of the west (aetai zephyroio)." "[The Titan Prometheus calls on the spirits of nature to witness his torment :] ‘O you bright sky of heaven (dios aithêr), you swift-winged breezes (takhypteroi pnoiai) [i.e. the Aurai], you river-waters (pêgai potamôn), and infinite laughter of the waves of sea (pontos), O universal mother Earth (panmêtôr gê), and you, all-seeing orb of the sun (panoptês kyklos hêlios), to you I call! See what I, a god, endure from the gods.’"
"[The Okeanides (Oceanids) arrive on the mountain of Prometheus in a winged chariot :] ‘Our group has come in swift rivalry of wings to this crag as friend to you, having won our father's consent as best we might. The swift-coursing breezes (aurai) bore me on . . . unsandalled I have hastened in a winged car.’"
"[The Breezes bring Ares news of the death of his daughter Penthesilea in the Trojan War :] For the Aurai (Breezes), Boreas' (the North-Wind's) fleet-winged daughters, bare to him, as through the wide halls of the sky he strode." "The East Wind [Euros] left the rosy chamber of Eos (the Dawn) his mother, and fanned the blazing pure all night long, stirring up the windfed leaping fire; the wild Aurai (Breezes), neighbours of the sun, shot the gleams into the air." "[Ariadne is abandoned by Theseus on the island of Naxos :] Boreas (the North Wind) lovelorn himself cared nothing for the maid stricken with desire--yes, even the Aurai (Breezes) themselves must have had a spite against the maiden when they carried the ship [of Theseus away] to the Athenian land."